Organisations involved in the project said the tag should provide better information on the birds' movements. 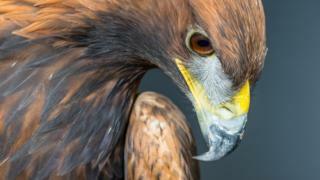 It should also give an "instant fix" on any eagles that die, which would help in efforts to tackle wildlife crime. They said tags in current use were "limited" in what information they could provide on the exact location of any bird which dies. The project team said that the new tag's multiple sensors can send a "distress signal" with an exact location if unusual behaviour is detected. Environment Secretary Roseanna Cunningham said the trial should improve understanding of the behaviour of the Cairngorms' golden eagles. She said: "The tags should make a real difference in deterring would-be criminals, as well as playing a key role in establishing exactly what happened, should any of these magnificent birds of prey disappear or die in unusual circumstances." Grant Moir, of the national park authority, said: "Raptor conservation and tackling wildlife crime is one of the aims of the recently launched Cairngorms Nature Action Plan 2019-2023. "This is an exciting breakthrough in the technology around raptor conservation, understanding the birds and combating wildlife crime." Robbie Kernahan, of Scottish Natural Heritage, described the tag as "exciting new technology". He said it should be a "significant deterrent" to anyone thinking of persecuting raptors.